Summary: Many generations ago, a mysterious cataclysm struck the world. Governments collapsed and people scattered, to rebuild where they could. A mutation, “the Change,” arose, granting some people unique powers. Though the area once called Los Angeles retains its cultural diversity, its technological marvels have faded into legend. “Las Anclas” now resembles a Wild West frontier town… where the Sheriff possesses superhuman strength, the doctor can warp time to heal his patients, and the distant ruins of an ancient city bristle with deadly crystalline trees that take their jewel-like colors from the clothes of the people they killed. Review: The book Stranger centers on what happens when Ross Juarez, a teenaged prospector, is rescued and brought to the town of Las Anclas, a post-apocalyptic take on the classic Western setting in the desert — complete with saloons and mysterious strangers. The town is under constant threat by invaders and is walled off from the desert by huge, mechanized gates. Out in the desert, crystalline trees kill anyone who happens upon them. Inside the town, some people are Changed and have certain powers, while other people remain Norms… naturally, there’s conflict and tension between the two groups. The detail and strong worldbuilding in Stranger are both its strength and its weakness. The detail-heavy prose, combined with the huge cast of characters, made the book difficult to get into at first… but, once the stage was set, the story really hit its stride. It’s a thrilling adventure to read, once you get far enough in. The story is told from five perspectives — Mia Lee, Felicite Wolfe, Ross Juarez, Jennie Riley, and Yuki Nakamura. The variety of characters in the book is portrayed in a skillful way and each provides a unique view of the story. People of different ages, sexualities*, and ethnicities are integrated seamlessly into the world. It’s so rare to find a book that depicts POC and LGBTQIA characters in a way that doesn’t rely on stereotyping or tacky descriptions… in this regard, reading the Stranger was a refreshing change from the norm. Diversity is done well in this book. The best part was the relationships — the friendship between Mia and Jennie, the bond between Mia and her father, and Yuki’s romance. This, together with the cool setting, made Stranger a delight to read. 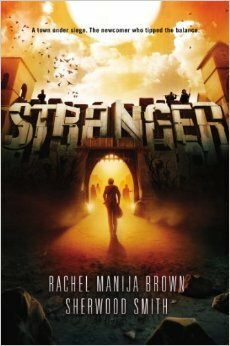 If you’re into Westerns, or well-written somewhat dystopian fiction, the Stranger is worth reading. Pick up Stranger when you have the chance! Recommendation: Get it soon! The post-apocalyptic Western take is definitely worth a read.